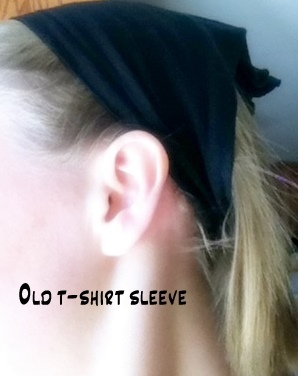 Re-purposing an old t-shirt…what to do with the sleeve? I was taking a t-shirt the other day and turning into a women’s vest…as I was playing around with scraps, I found that the sleeve had more of a purpose than just garbage! As a fidgeted around with it I found myself putting it on over my hair- WALAH! A headband 🙂 Now, for me all I did was cut the sleeve off and use it as is, but you could sew the edges, add a bow…the sky is the limit! P.S. this pic is of my super-fine hair…I bet it would look even cuter in thicker hair! Got any other neat ideas for t-shirt sleeve scraps? Send them or pics of you or your daughter in a t-shirt sleeve headband to sunderhill@live.com and I will post them here!